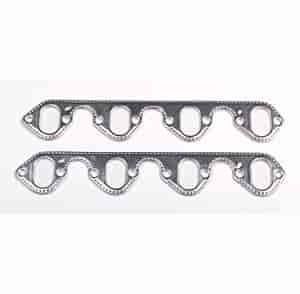 Percy's Seal-4-Good Reusable Flange Gaskets are multi-layered and made from a special "Dead Soft" aluminum that conforms to header flanges for the ultimate seal. Because made from multiple layers of dead soft metal, Seal-4-Good easily conforms to small imperfections that copper gaskets simply can't, and these gaskets will not blow out or burn out when properly installed. JEGS Complete Kit is a one-stop shop for some of the most common automotive applications. Save time and money, and benefit from the experience of the high-performance enthusiasts at JEGS. Does Percy's 66035 fit your vehicle? 66035 is rated 5.0 out of 5 by 2. Rated 5 out of 5 by Ried from Great product Bought these for 1978 bronco with a 460 worked great no exhaust leak and they don't burn up in a month.